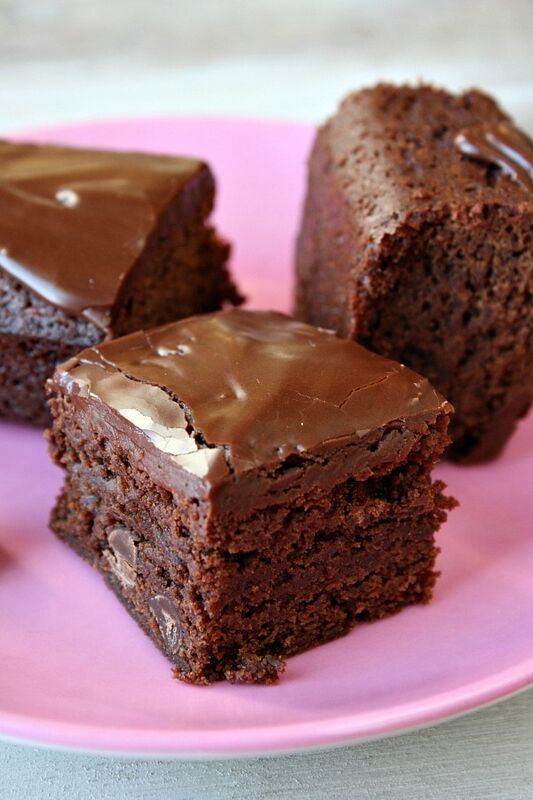 For my chocolate-loving friends, these Chocolate Fudge Brownies are for you. They’re totally chocolatey, they’re packed with chocolate chips, and they’re topped with a thick chocolate glaze! This recipe comes from the Joy the Baker cookbook. It’s a pretty great baking cookbook indeed. If you scroll down the post a bit, you’ll find my review of the cookbook and a little more information about it. 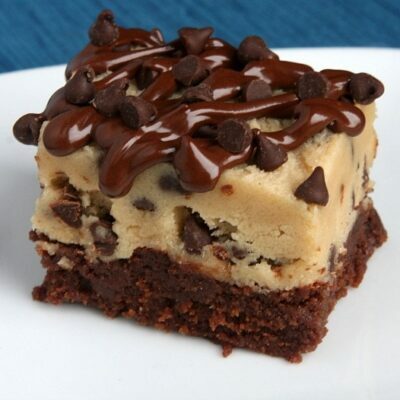 I can’t even imagine what these beautiful brownies would taste like with Ovaltine. I think they’d be SO DELICIOUS! There is absolutely nothing better than a perfect, chocolatey, fudgy brownie. Don’t you agree? This is that sort of brownie recipe. 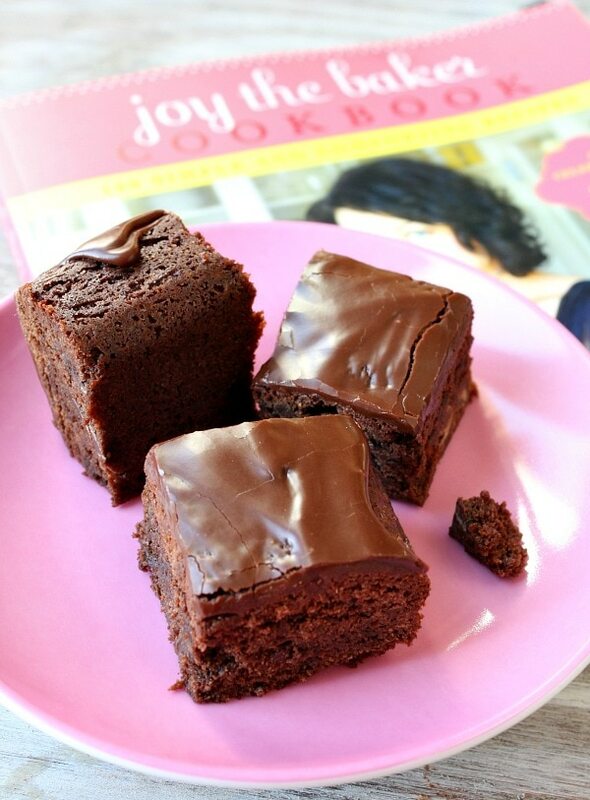 Anyway… I like to top Joy’s brownies with a simple chocolate glaze instead. It works for me, and it works for these brownies, and it works for everyone who consumes them. 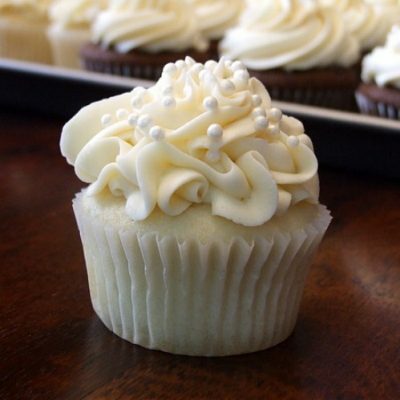 They are always a huge hit! See those fudgy brownies with that thick layer of glaze? That’s why I love them so much! If you’re a total chocolate lover, then I think you’ll really enjoy these brownies. This brownie recipe is a major keeper! I have had the good fortune of meeting Joy the Baker a few times. She’s a fun, flirty, cute, single girl. I’d totally set her up with my best guy friend if he wasn’t already married. 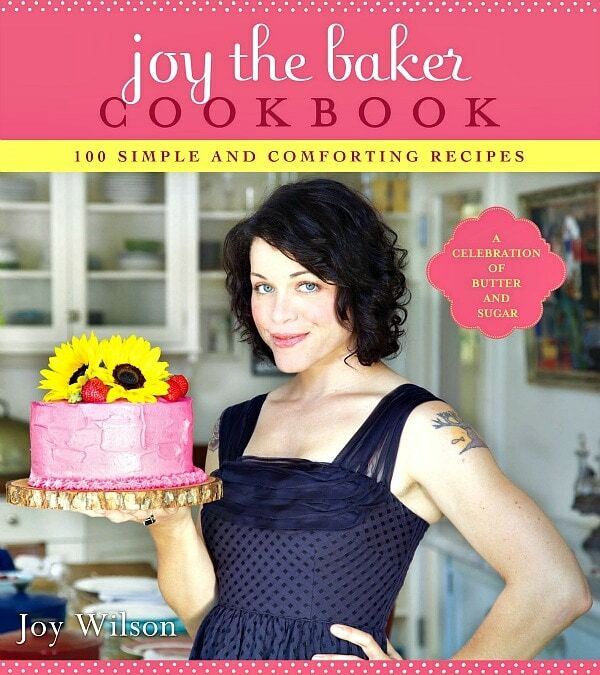 Joy’s debut cookbook, Joy the Baker, was released at the end of February. Her book is no less than awesome. 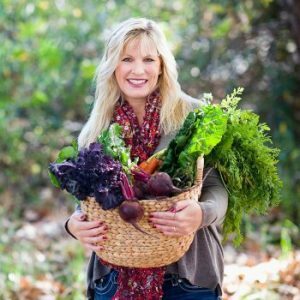 Joy shot all of her own photography, and I love all of her tidbit stories and intros to her recipes. The girl is just plain cool. I’m excited to try the following recipes from this book: Baked Coffee Cake French Toast, Giant Cinnamon Rolls with Buttermilk Glaze, Oatmeal Cookie Pancakes, Peanut Butter Bacon Cookies, Peanut Butter Birthday Cake, Pineapple Malted Milkshake, Strawberry Cookie Dough Ice Cream, Chocolate Malt Bread Pudding and Vanilla Bean Snickerdoodles. Everything looks so good! If you’re lurking around these brownies, that probably means you are a lover of chocolate. You might also enjoy my Chewy Gooey Flourless Chocolate Cookies or this Molten Chocolate Cake. Chocolate Banana Muffins would be a nice way to begin your day if you’re a chocolate lover too! 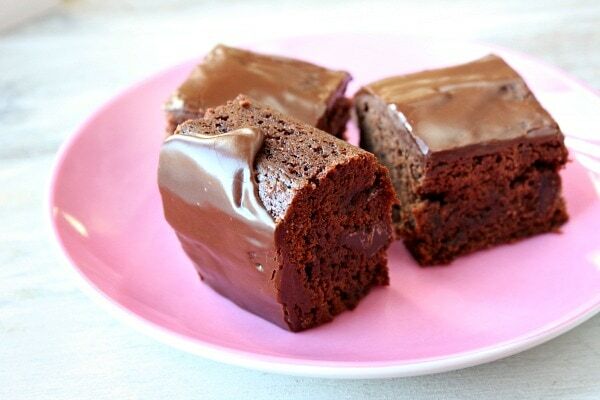 These Chocolate Fudge Brownies are topped with a thick glaze. Preheat the oven to 350 degrees F. Spray an 8-inch baking dish with nonstick spray, then line it with a strip of parchment paper (edges hanging over), and spray the parchment with nonstick spray too. In a medium bowl, whisk together the flour, baking powder and salt. In a large, microwave-safe bowl, heat the butter and chocolate until butter is melted (about 75 seconds). Whisk the butter and chocolate together until the chocolate is melted and smooth (heat a few more seconds, if needed). Alternately, you may melt the butter and chocolate together in a pan set on top of a pot of simmering water. Remove from heat. Whisk the sugars into the mixture. Then whisk in the eggs, yolk and vanilla. Stir in the flour mixture until well incorporated. Fold in the chocolate chips. 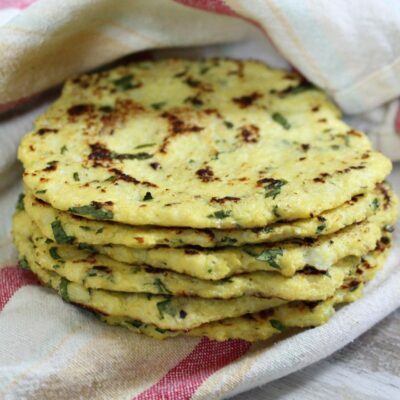 Pour the batter into the prepared pan and bake for 25 to 30 minutes. Bake until a skewer inserted into the center of the brownie comes out clean. Remove from the oven and cool completely before adding the glaze. In a small bowl, combine the powdered sugar, cocoa and vanilla. 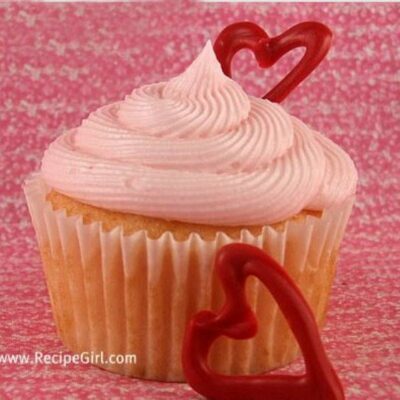 Whisk in 4 teaspoons of hot water, then add more water- 1 teaspoon at a time- until you reach a desired glaze consistency. You want to be able to pour it on the brownies. Use the parchment paper to move the brownies from the pan to a cutting board. Pour the glaze on top of the brownies, and use the bottom of a spoon to gently spread it to the edges. Let the glaze set (chill if you'd like) before cutting. Disclosure: There are Amazon affiliate links included within this post. 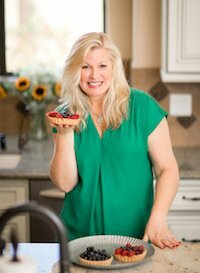 I was given a copy of the Joy the Baker cookbook for review and had permission to share a recipe from the book. All opinions shared are my own. Saw these on Pinterest tonight, made them tonight! turned out yummy even though I had semi sweet chocolate blocks and only stick margarine. i made these, with a bit of cinnamon and a fudgy chocolate frosting that was to die for – thanks for inspiring me! I tried these and they were delicious! 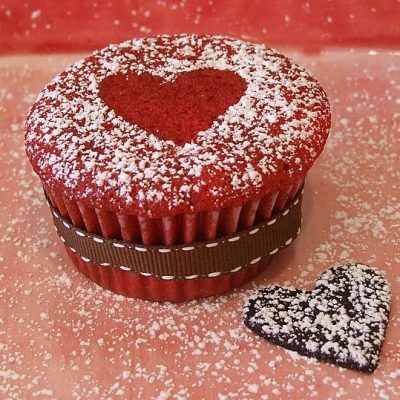 Was in the need for something sweet tonight and came across this recipe on Pinterest. YUM YUM YUM!! 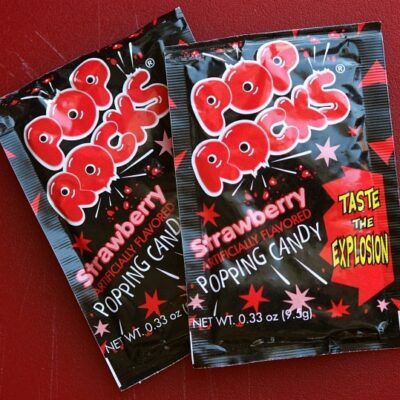 These hit the spot. Thanks for sharing. Made these today. They are so so yum! and i love the glaze on these! Thanks! Would you store these in the fridge or room temp? Thanks! I like to keep them in a covered container in the refrigerator. But room temp is totally fine too! They do look scrumptious. I love a good brownie and years ago I discovered a trick in making the Best brownies no matter what recipe you use. It is to sprinkle over the brownies while they are still hot from the oven Godiva Dark Chocolate liquor. The milk chocolate liquor is not as good. This makes the brownies have such a yummy rich, decadent flavor you will never leave this ingredient out of your brownies again! 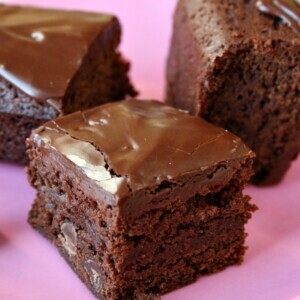 I already have the book, made these (with Ovaltine) and I concur, they are heaven. Also made about 7 other things so far – fantastic!